Camelot Weimareners have been bred over 30 plus years to be hip dysplasia free and offers a money back guarantee on any dog that develops dysplasia. Unfortunatley, dogs cannot be x-rayed to have thier hips examined until they are 2 years old when thier hips are fully developed.. It is therefore very important to pay attention to the dogs pedigree. 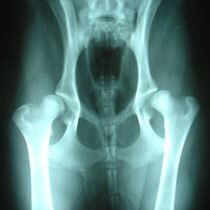 A dog with no dysplasia in its heritage will have the the least likely opportunity to develp the defect. Camelot Weimarener only breed dog wich have succefully been certified by the Orthopedic Foundation of America as having good, dysplastic free hips. 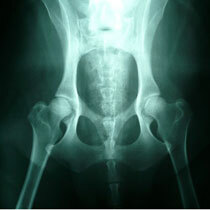 The following is a summary explanation of hip dysplasia but to learn more click here. In the normal anatomy of the hip joint, the femur (the thigh bone) is connected to the pelvis at the hip joint. The almost spherical end of the femur head (the caput, or caput ossis femoris) fits into the acetabulum (a concave socket located in the pelvis). The bony surface of the femur head and of the acetabulum are covered by cartilage. While bones provide the strength necessary to support body weight, cartilage ensures a smooth fit and a wide range of motion. Normal hip function can be affected by congenital conditions such as dysplasia, discussed in this article, trauma, and by acquired diseases such as osteoarthritis and rheumatoid arthritis. The body reacts to this in several ways. First, the joint itself is continually repairing itself and laying down new cartilage. However cartilage repair is a relatively slow process, the tissue being avascular. In dogs, the problem almost always appears by the time the dog is 18 months old. The defect can be anywhere from mild to severely crippling. It can cause severe osteoarthritis eventually. The above is reproduced under the terms of Wikipedia's copyleft rules and regulations.